Regulation (EC) No 661/2009 requires the installation of gear shift indicators (GSI) on all vehicles, which are fitted with a manual gearbox, of category M1 with a reference mass not exceeding 2 610 kg and vehicles to which type-approval is extended in accordance with Article 2(2) of Regulation (EC) No 715/2007 of the European Parliament and of the Council of 20 June 2007 on type-approval of motor vehicles with respect to emissions from light passenger and commercial vehicles (Euro 5 and Euro 6) and on access to vehicle repair and maintenance information (2). Regulation (EC) No 661/2009 requires the technical details of its provisions on GSI to be defined by implementing legislation. It is now necessary to set out the specific procedures, tests and requirements for such type-approval of GSI. Directive 2007/46/EC of the European Parliament and of the Council of 5 September 2007 establishing a framework for the approval of motor vehicles and their trailers, and of systems, components and separate technical units intended for such vehicles (Framework Directive) (3) should therefore be amended accordingly. they have a reference mass not exceeding 2 610 kg or type-approval is extended to them in accordance with Article 2(2) of Regulation (EC) No 715/2007. This Regulation does not apply to ‘vehicles designed to fulfil specific social needs’ as defined in Article 3(2)(c) of Regulation (EC) No 715/2007. ‘tailpipe emissions’ means tailpipe emissions as defined in Article 3(6) of Regulation (EC) No 715/2007. For the purpose of assessing whether a gearbox meets the definition according to Article 3(16) of Regulation (EC) No 661/2009, a gearbox having at least one manual mode according to Article 2(4) of this Regulation shall be considered as a ‘manual gearbox’. For this assessment, automatic changes between gears, which are performed not to optimise the operation of the vehicle but only under extreme conditions for reasons such as protecting or avoiding the stalling of the engine, are not considered. 1. Manufacturers shall ensure that vehicles placed on the market, which are covered by Article 11 of Regulation (EC) No 661/2009, are equipped with GSI in accordance with the requirements of Annex I to this Regulation. submit to the technical service responsible for conducting the type-approval tests a vehicle which is representative of the vehicle type to be approved to enable the test described in point 4 of Annex I to be carried out. 3. Based on the elements provided by the manufacturer under points (a), (b) and (c) of paragraph 2 and the results of the type-approval test referred to in point (d) of paragraph 2, the type-approval authority shall assess compliance with the requirements of Annex I. It shall issue an EC type-approval certificate according to the model set out in Part 3 of Annex II to this Regulation for the vehicles covered by Article 11 of Regulation (EC) No 661/2009 only if such compliance is established. For the purpose of monitoring the effects of this Regulation and evaluating the need for further developments, manufacturers and type-approval authorities shall make available to the Commission, upon request, the information set out in Annex II. This information shall be treated in a confidential manner by the Commission and its delegates. Annexes I, III, IV, VI and XI to Directive 2007/46/EC are amended in accordance with Annex III to this Regulation. Done at Brussels, 24 January 2012. (2) OJ L 171, 29.6.2007, p. 1. 1.1. The shift recommendation shall be provided by means of a distinct visual indication, for example a clear indication to shift up or up/down or a symbol that identifies the gear into which the driver should shift. The visible indication may be complemented by other indications, including audible ones, provided that these do not compromise safety. 1.2. The GSI must not interfere with or mask the identification of any tell-tale, control or indicator, which is mandated or supports the safe operation of the vehicle. Notwithstanding point 1.3, the signal shall be designed so that it does not distract the driver’s attention and to avoid interfering with proper and safe vehicle operation. 1.3. The GSI shall be located in compliance with paragraph 5.1.2 of UNECE Regulation No 121. It shall be designed such that it can not be confused with any other tell-tale, control or indicator the vehicle is equipped with. 1.4. An information display device may be used to display GSI indications provided that they are sufficiently different from other indications so as to be clearly visible and identifiable by the driver. 1.5. Temporarily, the GSI indication may be automatically overridden or deactivated in exceptional situations. Such circumstances are those that may compromise the safe operation or integrity of the vehicle, including activation of traction or stability control systems, temporary displays from driver assistance systems or events relating to vehicle malfunctioning. The GSI shall resume normal operation after the exceptional situations ceased to exist, and within a delay of 10 seconds or longer, if justified by specific technical or behavioural reasons. 2.1. The GSI shall suggest changing the gear when the fuel consumption with the suggested gear is estimated to be lower than the current one giving consideration to the requirements laid down in points 2.2 and 2.3. 2.2. The GSI shall be designed to encourage an optimised fuel efficient driving style under reasonably foreseeable driving conditions. Its main purpose is to minimise the fuel consumption of the vehicle when the driver follows its indications. However, regulated tailpipe emissions shall not be disproportionately increased with respect to the initial state when following the indication of the GSI. In addition, following the GSI strategy should not have any negative effect on the timely functioning of pollution control devices, such as catalysts, after a cold start. For this purpose vehicle manufacturers should provide technical documentation to the type-approval authority, which describes the impact of the GSI strategy on the vehicle’s regulated tailpipe emissions, under at least steady vehicle speed. 2.3. Following the indication of the GSI must not compromise the safe operation of the vehicle, e.g. to prevent stalling of the engine, insufficient engine braking or insufficient engine torque in the case of high power demand. the ‘extended documentation package’ that shall remain strictly confidential. an explanation of the purpose, use and functions of the GSI in a ‘GSI section’ of the user manual accompanying the vehicle. 3.1.2. The extended documentation package shall contain the design strategy of the GSI, in particular its functional characteristics. 3.1.3. Notwithstanding the provisions of Article 5, the extended documentation package shall remain strictly confidential between the type-approval authority and the manufacturer. It may be kept by the type-approval authority, or, at the discretion of the type-approval authority, may be retained by the manufacturer. In the case the manufacturer retains the documentation package, that package shall be identified and dated by the type-approval authority once reviewed and approved. It shall be made available for inspection by the approval authority at the time of approval or at any time during the validity of the approval. 3.2. The manufacturer shall provide an explanation of the purpose, use and functions of the GSI in a ‘GSI section’ of the user manual accompanying the vehicle. This test is to be performed on a warmed up vehicle on a chassis dynamometer according to the speed profile described in Appendix 1 to this Annex. The advice of the GSI is followed for shifting up gears and the vehicle speeds, for which the GSI recommends shifting, are recorded. The test is repeated 3 times. Vn GSI shall denote the average speed at which the GSI recommends shifting up from gear n (n = 1, 2, …, #g) into gear n + 1, determined from the 3 tests, where #g shall denote the vehicle’s number of forward gears. For this purpose only GSI shift instructions in the phase before the maximum speed is reached are taken into account and any GSI instruction during the deceleration is ignored. For the purposes of the following calculations V0 GSI is set to 0 km/h and V#g GSI is set to 140 km/h or the maximum vehicle speed, whichever is smaller. Where the vehicle cannot attain 140 km/h, the vehicle shall be driven at its maximum speed until it rejoins the speed profile in Figure I.1. 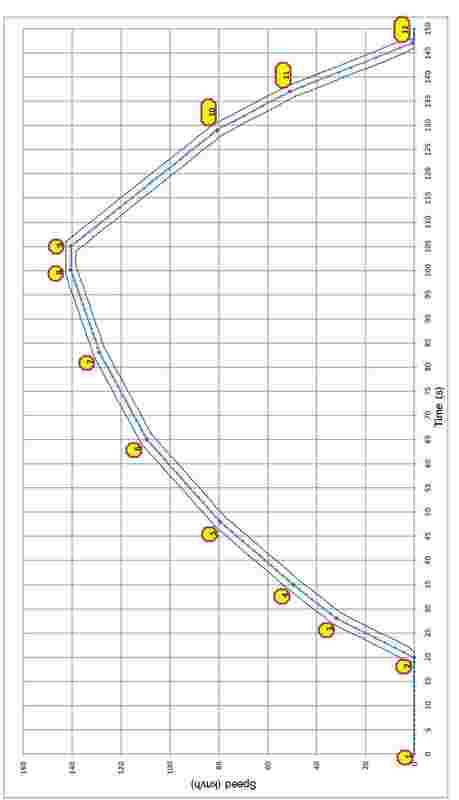 Alternatively, the recommended GSI shift speeds may be analytically determined by the manufacturer based on the GSI algorithm contained in the extended documentation package provided according to point 3.1. Vn min shall denote the minimum vehicle speed the vehicle can be driven in the gear n without stalling of the engine and Vn max the maximum vehicle speed the vehicle can be driven in the gear n without creating damage to the engine. If Vn std derived from this list is smaller than Vn + 1 min, then Vn std is set to be Vn + 1 min. If Vn std derived from this list is greater than Vn max, then Vn std is set to be Vn max (n = 1, 2, …, #g – 1). If V#g std determined by this procedure is smaller than V#g GSI, it shall be set to V#g GSI. The manufacturer shall supply the type-approval authority with the functional dependence of the vehicle’s fuel consumption on the steady vehicle speed when driving with gear n according to the following rules. FCn i shall denote the fuel consumption in terms of kg/h (kilograms per hour) when the vehicle is driven with the constant vehicle speed vi = i × 5 km/h – 2,5 km/h (where i is a positive integer number) in the gear n. These data shall be provided by the manufacturer for each gear n (n = 1, 2, …, #g) and vn min ≤ vi ≤ vn max. These fuel consumption values shall be determined under identical ambient conditions corresponding to a realistic driving situation that may be defined by the vehicle manufacturer, either by a physical test or by an appropriate calculation model agreed between the approval authority and the manufacturer. Where the maximum speed of the vehicle corresponds to step i and i < 28, the values of Pi + 1 to P28 shall be added to Pi. the values FCGSI, FCstd and FCrel. Save as calculated according to point 4.5. (1) Defined in Annex 4a of UNECE Regulation No 83, 05 series of amendments. The tolerances for deviation from this speed profile are defined in point 6.1.3.4 of Annex 4a of UNECE Regulation No 83, 05 series of amendments. The following table provides a second by second description of the speed profile. Where the vehicle is unable to attain 140 km/h, it shall be driven at its maximum speed until it rejoins the above speed profile. 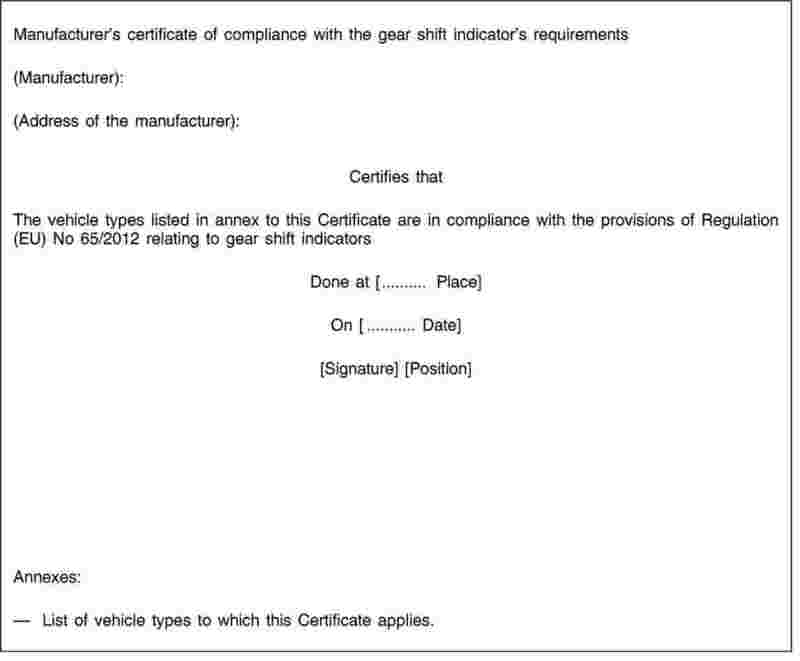 Information document No … relating to EC type-approval of a vehicle with regard to gear shift indicators. (1) OJ L 199, 28.7.2008, p. 1. L 28, 31.1.2012, p. 24.